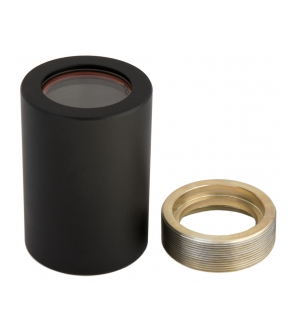 The Gobo Lens Adaptor can be fitted to all of Hunza’s standard 62.5-63.5mm (2 ½”) body fixtures, including the High Power range, converting them into mini projectors. The Gobo assembly consists of a convex lens, threaded barrel, and 51mm Gobo holder, which projects an image or light pattern onto the wall, floor or ceiling. The barrel is screwed in and out to focus the image.